I've returned from a one week girlfriends trip to Cuba, split between the cities of Havana and Trinidad. An adventure and culture packed seven days that I am so excited to recap for you! I've decided to break this post into three parts due to its large amount of content. First, the three days we spent in the Vieja neighborhood of Havana, followed by two days spent in Trinidad, and finally another two days back in Havana, in the Vedado neighborhood. Why Cuba? Cuba has been on my must-visit list for some time now. In fact, James and I first thought to honeymoon in Cuba over a year ago. However, I chickened out because I didn't feel confident enough in the visa requirements. After some friends proved Cuba was more accessible than the media portrayed, I was at a concert in April with two dear friends (Milly and Leslie) when Milly mentioned wanting to go. Maybe it was the double vodka sodas or the sweet, soothing sound of Andrew McMahon, but immediately we were all in. We awoke the next day and booked our tickets as "people to people" travelers. We worked together to outline each of our must-see landmarks. Among them; Hemingway's House, Hemingway's multiple bars, the Fabrica de Tobacco and Fabrica de Arte and at least one beach and one lush valley. We picked Trinidad over Vinales, sugar cane harvesting over tobacco. A tough call, but choosing Trinidad gave us access to one of the most beautiful beaches in addition to lush mountains. More about that in the next post. In preparation, we brushed up on some Spanish, purchased a Cuba tourist guide (thank you Leslie) and built up the anticipation with a Cubana playlist put together by Milly. Wouldn't you know it that just one week before our departure Trump announced his latest restrictions on travel to Cuba? I had to call the airline to receive confirmation that because we booked our tickets prior to the announcement we were still permitted to travel. It only boosted our excitement to realize we slipped into a slim window of time when Americans are able to travel to Cuba, through the United States, earning a Cuba stamp on our American passports. Upon touching down on Havana's tarmac I was overcome with immense sentiment over our fortune and place in history. I'm not exactly sure when Trump's restrictions go into effect or how drastically they will change American travel, but not having to go through Mexico or Canada felt triumphant. We began our journey in Havana Vieja, Old Havana. 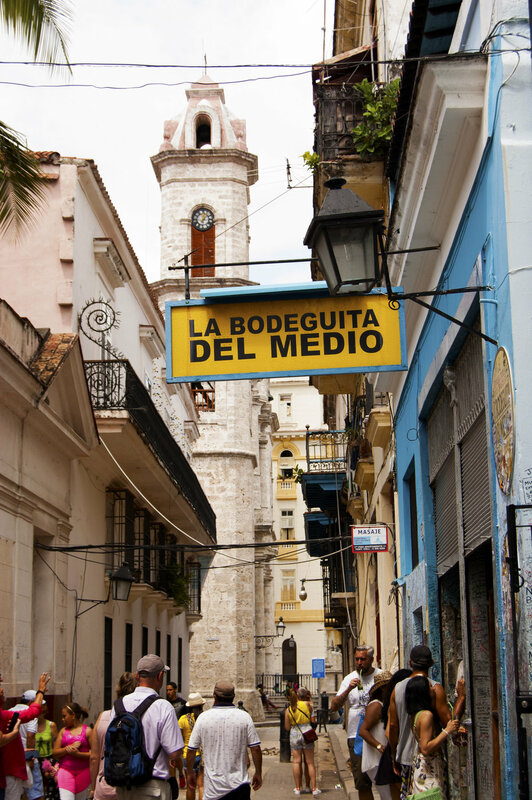 Much of Cuba's diverse history is memorialized throughout the timeworn streets. We booked all of our accommodations in casa particulares through AirBnB. Every place we stayed in was exceptional. Leyani was our first host and she eagerly welcomed us into her beautiful two-bedroom loft with a charming balcony. Immediately we were struck by Cuba's vibrant colors. Something that didn't diminish, but actually intensified, over our time spent wandering the country. The first activity we engaged in was a multi-hour walking tour through Old Havana, with a guide setup by our casa particular host. This young girl, Suri, spoke excellent English learned at her private school and was able to share an extensive amount of Cuban history with us. Along our tour we learned of the significance of many statues around town. The Giraldilla sits high atop this dome symbolizing Doña Isabel of Bobadilla, Governess of Cuba and wife of the explorer Hernando de Soto. Governor of Cuba by marriage, Hernadano left on a discovery expedition to the United States. There he died of illness, never to return, and still Isabel waits. You'll find Jose Marti prominently displayed around the country as one of Cuba's heroes, esteemed for his intellect and political prowess. The statue of Cecilia Valdés, a creole woman, is the character and name of a famous novel which shines light on racism and slavery in the country. The Templete is an essential monument in Havana as it is part of a yearly celebration of Cuba's history and a promise of good fortune for those who participate. Every November 16th, on Havana's birthday, the citizens young and old take hands and circle the monument built around a dying African silk cotton tree. Circling the monument three times, each time tossing a coin over one's shoulder, is believed to grant the passerby their wishes. Akin to the Trevi Fountain of Rome. Suri told us of the first U.S. cruise ship to arrive at the San Francisco Square after Obama opened the doors to Americans. She says that she and her family, along with hundreds to thousands of Cubans, lined the harbor to applaud and graciously welcome the first American tourists in ages. It gave all three of us chills to grasp how loved and accepted we are by the Cuban people. Also found in the San Francisco square is this sculpture that pays homage to a homeless man who wandered Havana until his death, a victim of worsening dementia. There are different stories as to why this man from Spain came to lose his mind. Some say he was arrested for a crime he didn't commit. Others say he lost his family in a boating accident while traveling to Cuba. Either way, he was beloved by the people of Havana and is memorialized in this likeness. Brushed gold where every passerby has stopped to touch his beard and extended finger for the promise of good fortune. Some other notable sites from our walking tour included the Spanish Embassy. There we learned any Cuban of Spanish decent is offered a Spanish passport, and with it, opportunities to travel to other countries not otherwise accessible to Cubans. We stopped for fresh coconut water in the relentless heat, posed near the beautiful classic 50's cars, awed at the medieval style police station known previously for inflicting torture and admired detailed street art. Every day a group of street performers, called Gigantería, dance high above the Havana crowd. They have joined the City Historian's Office with the intent of preserving and celebrating the country's Afro-Cuban traditions. Understandably, this group attracts a large following of anyone within earshot of their roaring trumpets. These cheerful, colorful acrobats bring joy year round. On our city tour it was suggested that frescoes by Michaelangelo were painted in the Havana Cathedral. While we located some fresco paintings, nothing was there to suggest Michaelangelo as the artist. We did, however, get to don some stunning wraps over our inappropriately short attire. Taking in as many Hemingway haunts as possible was at the top of our list of must-sees. Many Cubans and non-Cubans have proclaimed that Hemingway is responsible for the quote "My mojito in La Bodeguita, My daiquiri in El Floridita." The quote is written in seemingly Hemingway's handwriting and displayed at the La Bodeguita del Medio. Eater.com disputes the claim in this article. However, that has not spoiled the fun of tracking down both bars and enjoying their signature cocktails. We all agreed the best mojitos of our trip were at La Bodeguita. I love how our bartender doesn't even look at our glasses as he pours the rum. Nearby the Capitolio is the Fabrica de Tobacco. The Fabrica de Tobacco was once an operating tobacco factory, that has since halted operations. Today it is still a credible place to buy Cuban cigars and a beautiful building to see in person. We were warned over and over against buying cigars off the street. Many people will try to tempt you, but there's very little support that anything off the street will be authentic. We chose to pay a little more to know we were buying the real thing. Desiring to see actual cigar rolling we exerted ourselves on an expedition from Havana Vieja to Central Havana, seeking out the still active Romeo Y Julieta Cigar Factory. It's a gorgeous building, but unfortunately they closed their doors at 1pm and we missed our opportunity to witness the hand rolling. Our strenuous walk back required multiple rest breaks, but we made it eventually. Along the way back we stumbled upon some interesting street art. Not to offend anyone, but it does accurately portray the responses we routinely received to Trump's recent actions against the country. The Malecón is a long stretch of sea wall that splays all the way from the Vieja neighborhood, through Central Havana and ends at the Vedado neighborhood. It's essential to the Havana experience to sit along this boardwalk, fluttered with musicians and people fishing, while the majority relax to sound of the waves crashing as the sun sets over the Fortaleza de San Carlos de la Cabaña. Every night at 9pm a cannon goes off at this fortress. It is a tradition that stems from when the Spanish ruled Cuba. A wall was built around Havana, and the cannon signaled to the community that the city was closed for the evening. No one was allowed to enter or exit the city until the following morning. This was to protect the citizens against threatening pirates. Parts of that wall are still intact to this day and can be found around town. We spent multiple evenings at the Malecón, choosing it as our spot to share in some Havana Club rum and our Cuban cigars. The Romeo y Juliatas we purchased earlier at the Fabrica de Tobacco. Quickly the skies let loose on us and we found ourselves seeking refuge from a downpour under a tree. Not to fret. We polished off our bottle of rum and decided to laugh our way through the flooding streets and back to our casa. Upon arrival we noticed Leslie's artist friend sitting quietly in his gallery. Leslie had purchased some art from him earlier in the day. He brightened up when we burst in, dripping wet, and offered us yet another bottle of rum and a light for our unblemished cigars. We spent the entire evening amusingly communicating between Spanish and English. It was the most authentic, genuine and beautifully spontaneous experience of the trip, for all of us.